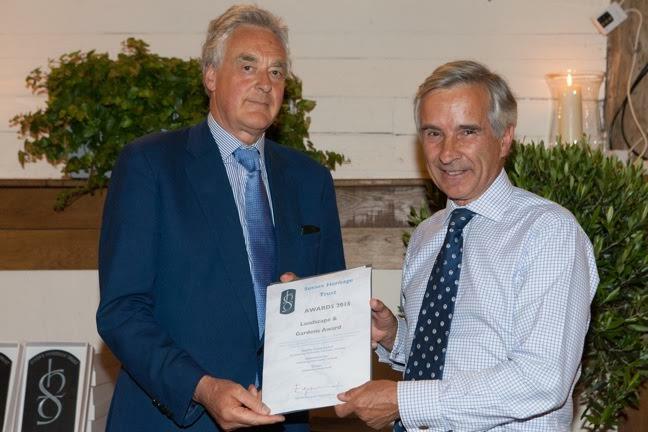 This year’s Sussex Heritage Awards has been a great success. The number of entries (66) was up on previous years, standards were very high and the whole process extremely competitive. Two hundred people from all over Sussex and beyond met at Pangdean Old Barn, Pyecombe (a previous Award-winning building) on Thursday, 9th July to hear the announcement of the results of this year’s Awards scheme and witness the presentation of plaques and certificates to the Award Winners and Highly Commended projects by our President, The Rt Hon Lord Egremont. A new 5 acre mixed woodland adding to an existing policy of natural habitat creation on the Estate. Replanting of semi-mature hazel, beech, alder and other indigenous trees removed from a new build scheme is an interesting precedent. The pheasant habitat for which the wood was created, is a diverse use of farmland in the Estate and supports rural employment in the countryside. Thank you for being part of the 2015 Sussex Heritage Awards and many congratulations on your achievement.